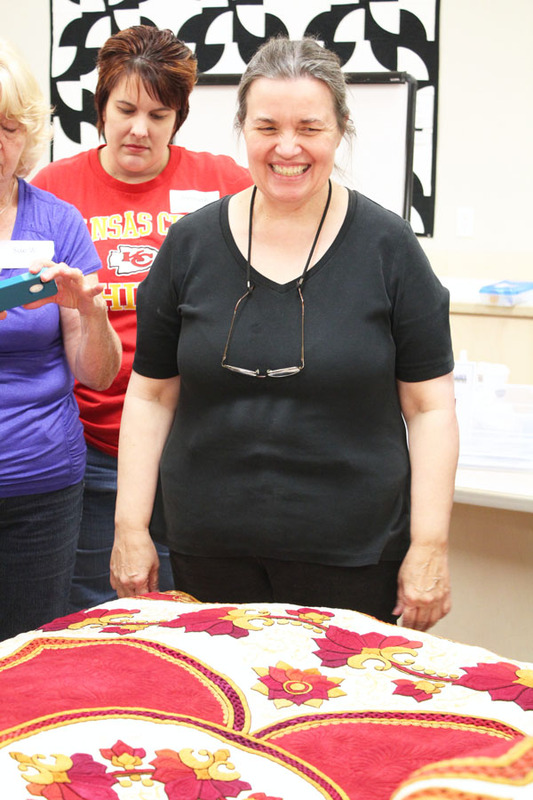 Earlier this week I had the chance to take a class from Sharon Schamber, an amazing free-motion quilter. When I saw Quiltique advertise the free-motion feathers class, I immediately knew I wanted to sign up. One of my goals last year was to get comfortable with free-motion quilting. I never did it. I hoped that this class would give me the push I needed. In whatever form that might be. Inspiration, knowledge, tools… I was lacking in all these departments. When I signed up for her class, I had no idea who Sharon was. Really. I do know that Quiltique always brings in amazing teachers, and I have never met a single guest teacher in their classroom who didn’t live up to the hype (and then some)! 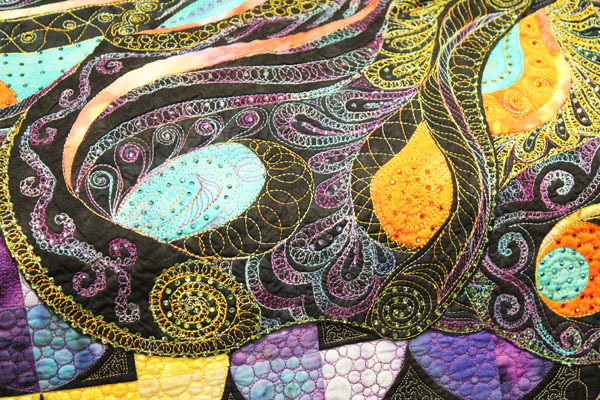 She is an Award Winning Quilter, nationally (probably Internationally) recognized for her work. It was an all-day class, and very little of it was actually spent behind the sewing machine. The first half was a lot of lecture. Sharon has a unique teaching style that I won’t spoil for you by trying to explain it. But I learned more in class than quilting (for example, apparently I have a “biker chick” aura… for those of you who have met me in person, feel free to debate or agree). We talked a lot about the role of quilting, the proportion of quilting, and how to make decisions about quilting a quilt. I could listen to her lecture for another day and still feel like I only learned a little of what she had to offer. She didn’t share her quilts until the very, very end of class… and I’m glad. Had I seen all this beautiful quilting beforehand, I might not have been able to focus on the class! 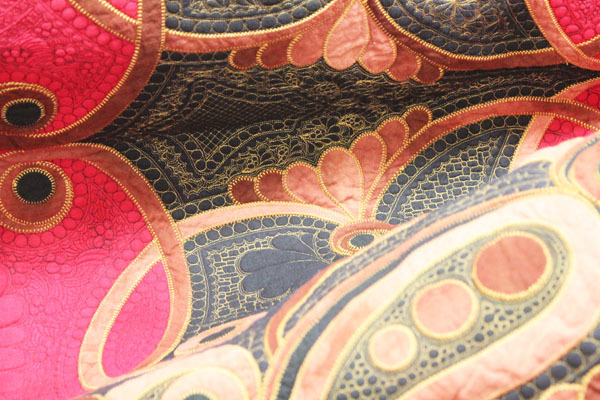 I know it is hard to tell scale in these photos, but just check out all the beautiful detail in this quilting! The gold thread in this next photo is bobbin work. A whole different technique… but check out the fill in the white space behind the bobbin work. Ah-maze-ing. I snapped a photo of the back of one of the quilts as it was being folded up. You can see fingers in the top right of the photo, which gives you an idea of the scale here. Some of this quilting is seriously tiny! I was fascinated by this little study. Each of these 9 squares is just 2.5″ across! How many stitches can you fit in a 2.5″ square? This gives you a better picture of how small this really is. 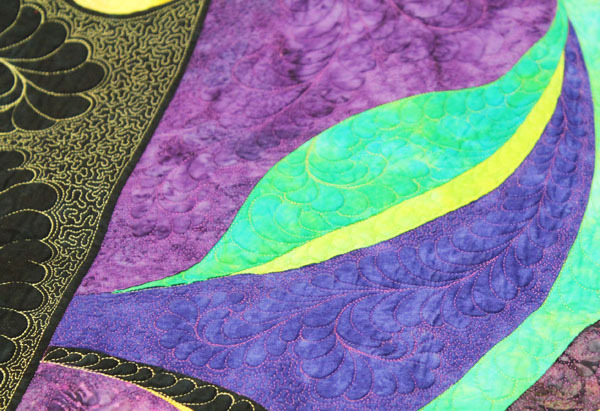 This next quilt is all made from hand-dyed cotton. 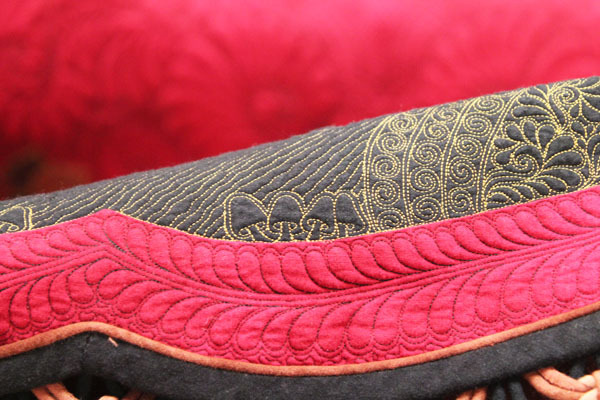 All the texture the quilting adds makes it look like velvet! The different colored threads here help the quilting really stand out on this quilt. This is a shot as this quilt was being opened. There are 99 different stipples on this quilt. A stipple is small quilting usually done on sections of the quilt that are in the background. 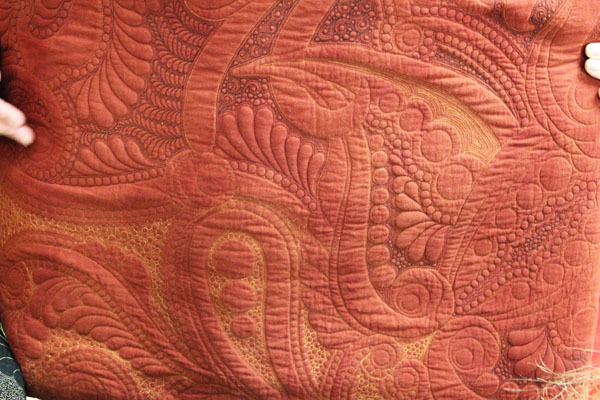 Here is an amazing fill – that wavy-line quilting with the cross-lines between? Wow. And this is probably my favorite shot. These little toadstools live right on the edge of the quilt. Like a little secret surprise. I wonder how many surprises live in the quilting on this quilt? 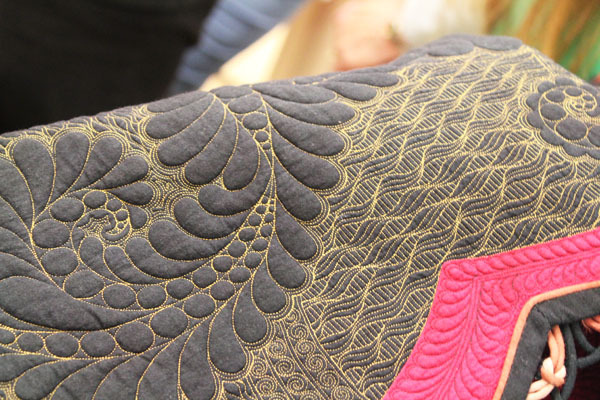 One last shot of her quilting… this beautiful feather! As a beginner, I’m not anywhere near this skilled. Her quilts are something to aspire to. But, I did take the first steps! 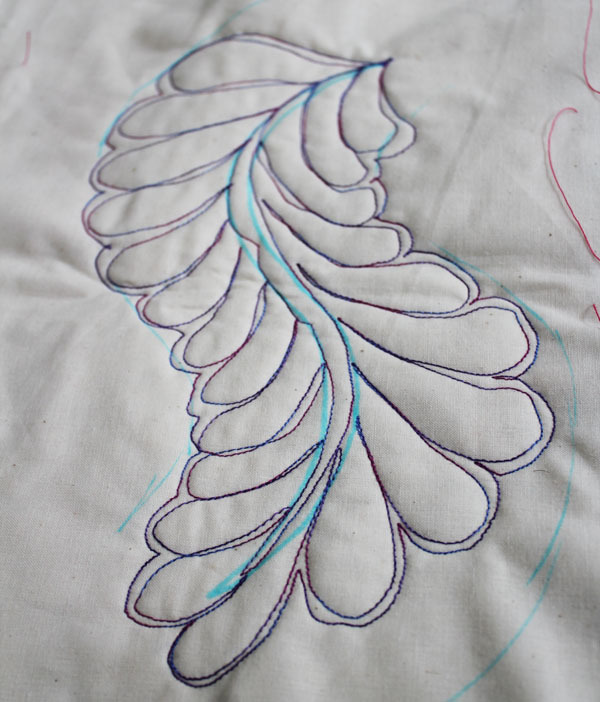 I had a chance to try three feathers in class… and here is the third one! Yeah, I’m no Sharon Schamber… but for my third attempt at a free-motion feather, I have to say I’m pretty proud of myself! I will have to keep working on it, practicing the shape and getting better control of my stitching speed… but I now have the tools, knowledge, and definitely the inspiration to make it happen! Should I Press My Quilt Seams Open or to One Side? 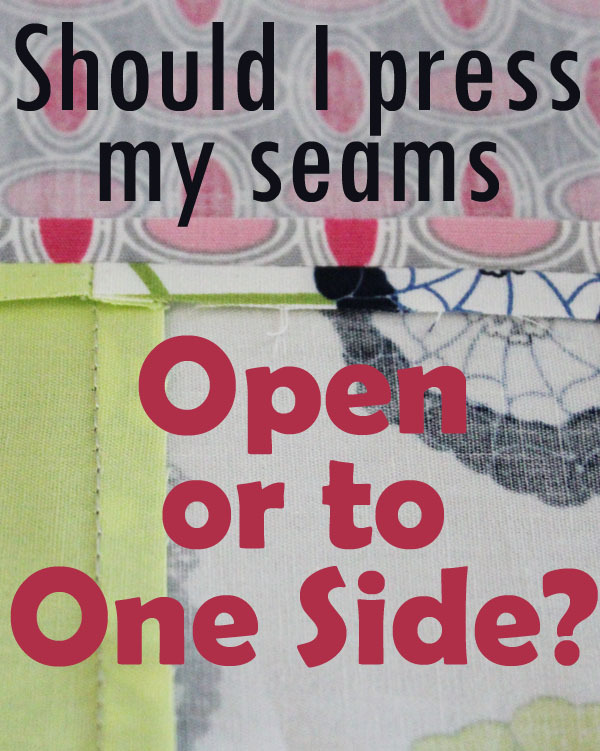 The quilting question “Should I press my quilt seams open or to one side?” comes up very often in my quilting classes. When my students ask me, I think they’re looking for a single, definitive answer. A quilting rule that they can follow or flaunt. The problem is that I believe in very few quilting rules. 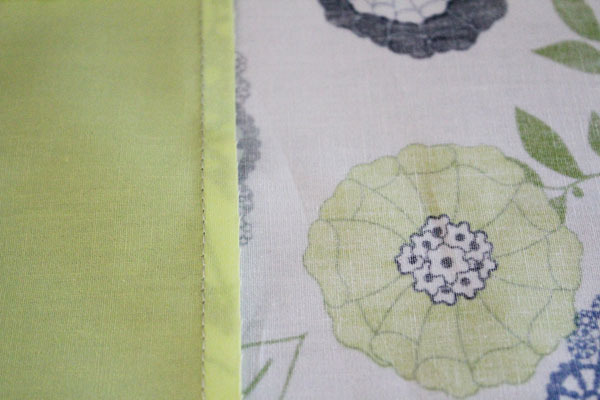 I believe that when quilting, you should press your seams. 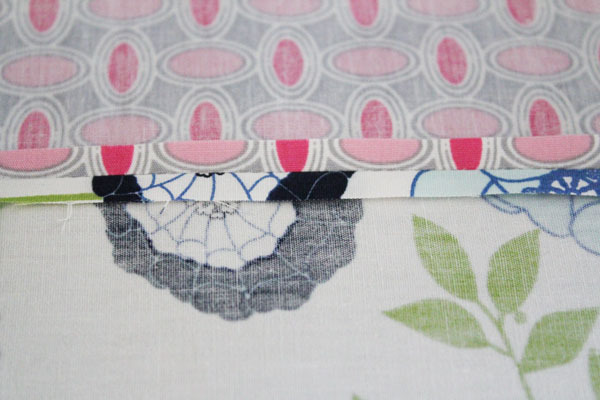 But how you press your quilt seams depends on a variety of factors. You should take these factors into account when you decide if you’re going to press your seams open, or to one side. How are you going to quilt your finished quilt? If you plan on doing a “stitch in the ditch” on your quilt blocks, your decision has been made – you must press your seams to the side. 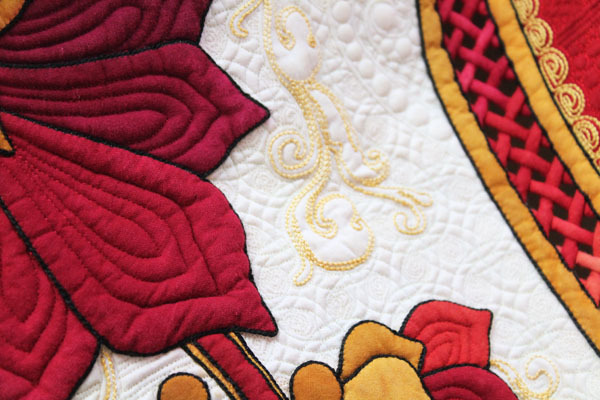 The quilting technique “stitch in the ditch” is so named because of where the stitching falls. Pressing the quilt seams to the side created a slight raise on one side of the seam – which results in a slight ditch on the other. 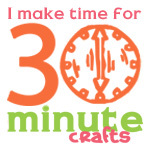 This is easy enough for a newbie quilter to find and aim at when quilting. 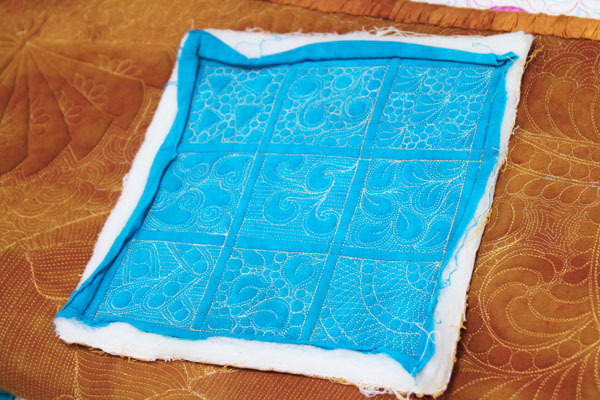 If you try to “Stitch in the Ditch” on a quilt where the quilt seams have been pressed open, you will be quilting along the seam line right between the pieces of the quilt top, and instead of securing the backing, batting, and top, you’ll be securing the backing and batting while tacking the top in place. 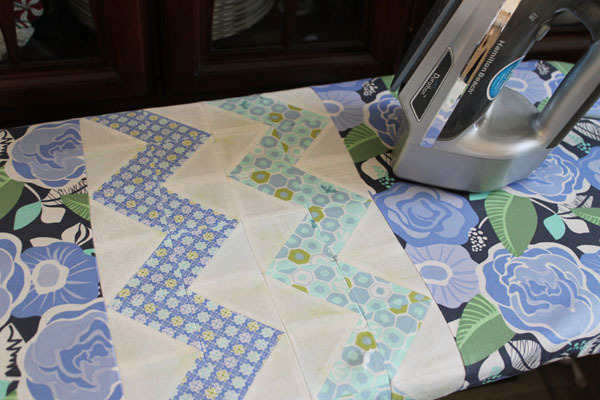 If you plan to do an all-over or a stitching pattern that does not closely follow the piecing of the blocks, you can press your seams however you like. How flat do you want your finished quilt top to be? Pressing quilt seams open results in flatter piecing. This is because instead of pressing all the bulk of the seam to one side, the bulk is divided in half and spread equally over two sides. 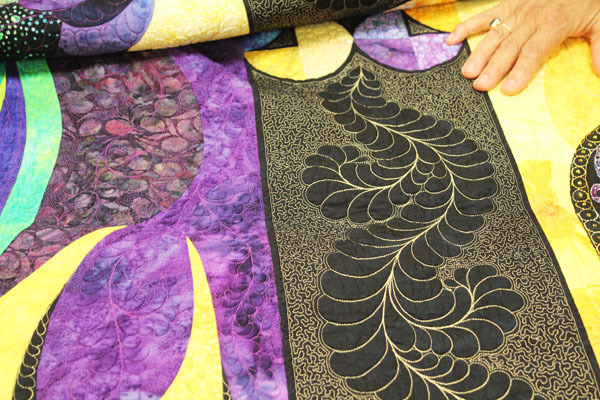 Your finished quilt blocks are much flatter than a block with the seams pressed to the side. 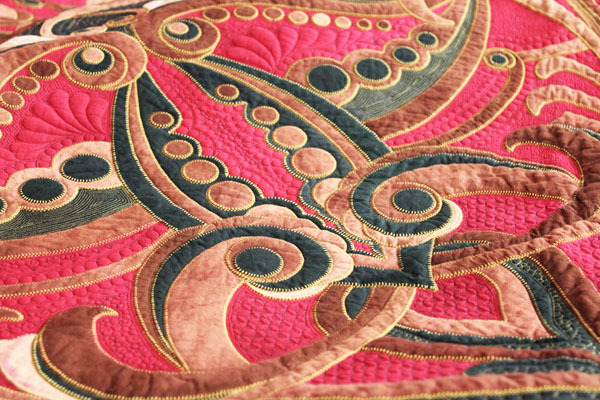 Once your quilt top is quilted together with the batting and backing, much of the flatness created by pressing seams open is lost into the batting, and a quilt with the seams pressed to the side is no more lumpy than one with the seams pressed open. What piecing techniques are you using? Depending on the techniques you are using when piecing your top, you may prefer one pressing method over another. If you are piecing many small pieces together, you may want to press the quilt seams open to reduce the bulk at the individual seams. However, if you are doing intricate piecing where you want to match your seams, pressing the quilt seams to the side may actually help you. If you press one seam up and one seam down before laying two pieces with their right sides together, the ditches of the two seams will “lock” together, helping line up the piecing, and resulting in more crisp lines and points. How do you press best? What is most important in pressing is that you do it, and do it as well as possible. I have seen new quilters who did not press properly, and lost as much as 1/2″ of fabric in each seam because of poor pressing. So, if there is one way that you prefer pressing because it makes you happier, go ahead and use that method. 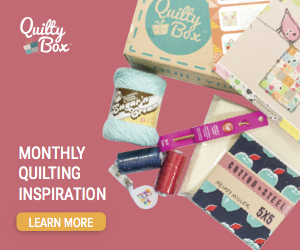 Because staying happy while you quilt is what it is all about anyway, right? Fabric Fest and a Rolie Polie Giveaway! 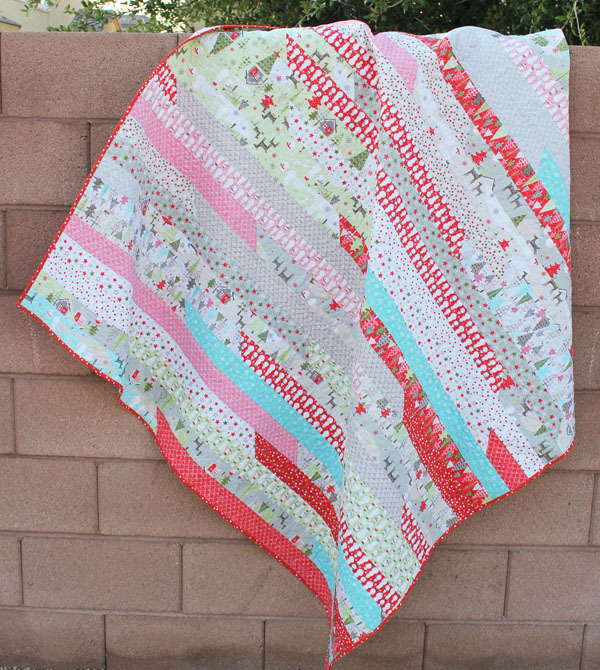 I’m so excited to share more of my Jelly Roll Race Quilts here today! Those of you who follow my blog know that I made a Jelly Roll Race Quilt in less than 24 hours from start to finish earlier this year, I called it my “#Instaquilt” because I Instagrammed the process of cutting fabric, stitching, getting it to the quilter, and binding it. 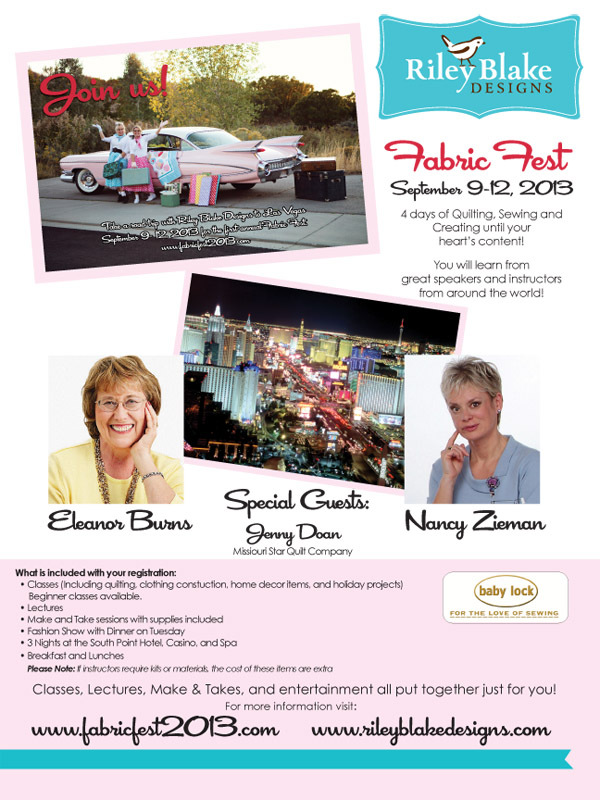 Since then, I’ve been busy coming up with fresh ways to revise this new classic so that I can share them all with you at Riley Blake Fabric Fest here in Las Vegas. I first learned about this quilt when I was working at Quiltique, an awesome quilt shop in Henderson, just outside of Las Vegas. One of our customers shared it with me, and it was love at first stitch. I have 2 nieces and 3 nephews all born in the last 3 years (3 of them in the last 12 months), so having a fast “go to” quilt pattern is a must! 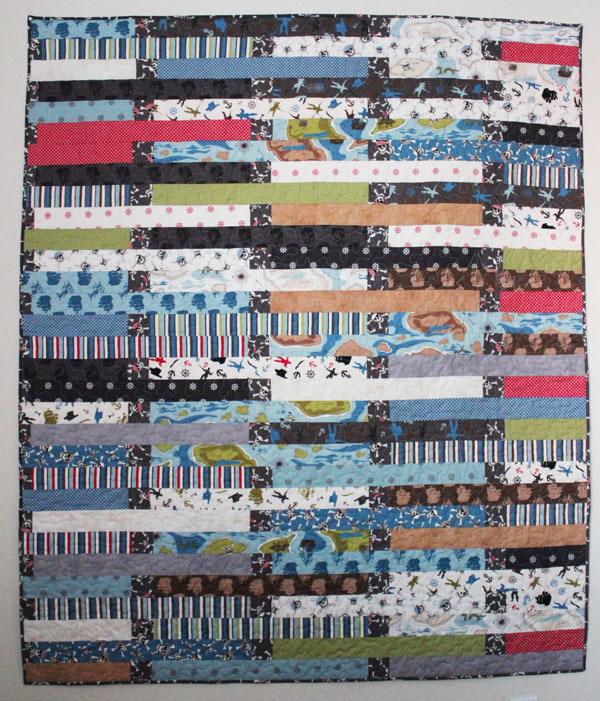 This first is a Standard Jelly Roll Race quilt. If you’ve seen or done one, you can tell by the mitered seams, and the random placement of the fabric. I used 42 strips from Riley Blake’s new Christmas Fabric “A Merry Little Christmas“. Don’t you love how cheery it looks? 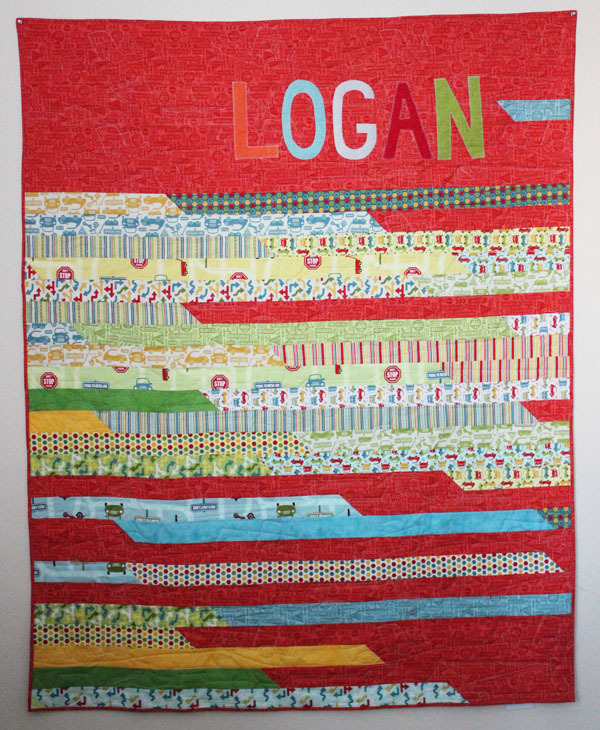 This quilt is the perfect Christmas gift! 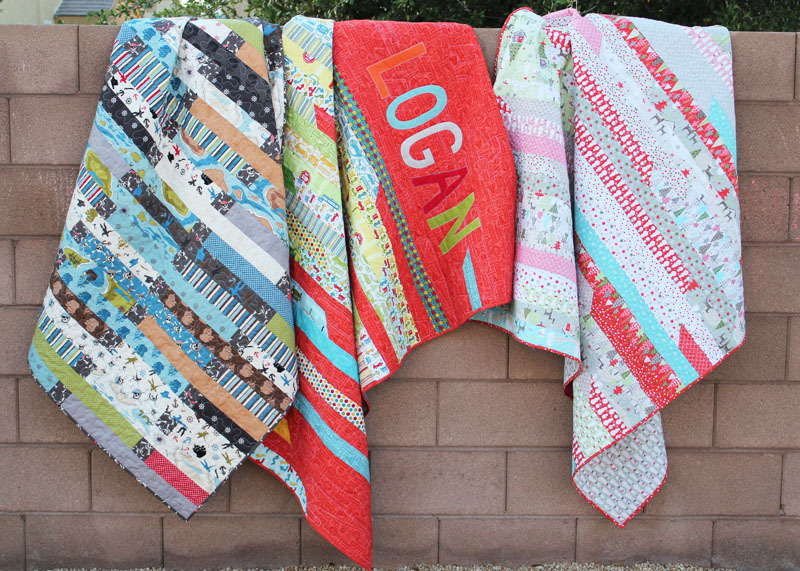 I love giving quilts as Christmas presents, and these quilts are the best for making as gifts. They don’t take weeks to make, they look cute in any fabric, and there is very little waste. After piecing your quilt top, the only waste you have is one piece 2.5″x18”, and the little bit you trim off to square your quilt top. This second one is so much fun! I used Riley Blake’s “Pirate Mateys” and added squares between half-strips of fabric. There are some secrets to putting this top together, but it is a lot easier than it looks, and the result is darling! 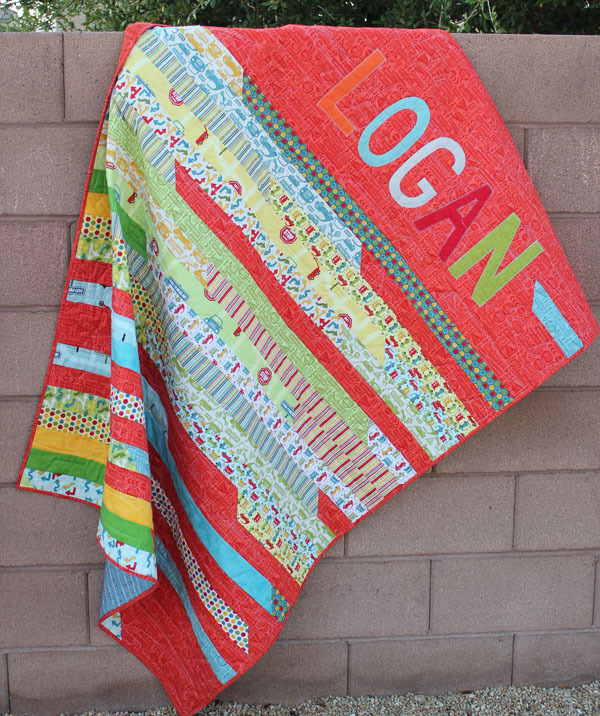 I’d love to do more of these with bright colored squares that really pop against the fabric. I’ve been enjoying this quilt a lot, it sits on my livingroom floor and my kids play on it all the time. My friend Nichol of A Desert Quilter quilted all of these for me, and she quilted some darling pirate motifs into this quilt top! My son is 4 and a half, and he loves this quilt. It is “his” quilt and he loves reading his name on it. Once you’ve deconstructed the placement of the strips in a Jelly Roll Race quilt, there are so many new possibilities that open up to you! I still have at least one more idea up my sleeve … but I’ll wait to share that one at Fabric Fest. You’ll have to come to my class so that I can share it with you! 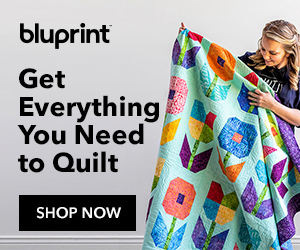 The base to make these quick quilts are Rolie Polies from Riley Blake. So, I’m giving away TWO Rolie Polies to one lucky winner! Just leave a comment at the end of this post letting me know which of these fast quilts you’d most like to learn more about! 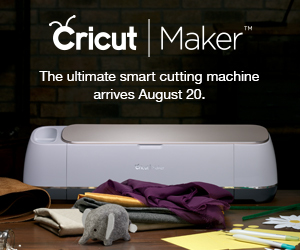 Make sure to include your contact information so that I can get in touch with you if you win. This post is part of an awesome blog hop with the rest of the teachers who will be sharing all their amazing talents at Riley Blake Fabric Fest. Check out the rest of these great teachers! 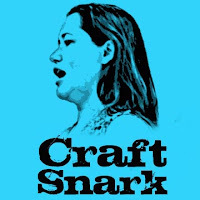 During the blog hop, these great sites will be blogging all about Fabric Fest and the wonderful classes they are teaching. They will also be giving away some great prizes, so you’ll want to keep this list close by! You CAN’T miss a single day! 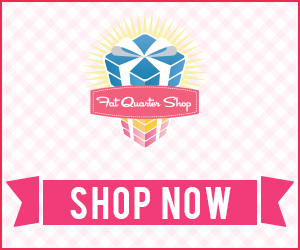 Many of you know that I used to work at a quilt shop here in Vegas. After my second son was born, I became a full-time at-home mom, instead of working outside the home. But, I couldn’t give up all the social interaction of hanging out with others, so I found a middle ground. I teach classes at the quilt shop – allowing me to stay home most of the time, but still get out and play with other quilters sometimes, too! 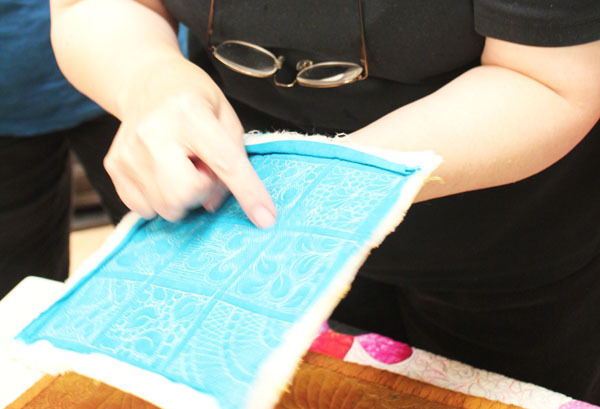 Taking and teaching classes, as well as staying active in the local Modern Quilt Guild are so fun for me… so I’m excited to share with you the new class I’m teaching this summer! I’m teaching a class on making an ironing board cover. I don’t know about you, but my ironing board is out all the time. I never put it away. And as a permanent piece of furniture in my home, I think it deserves some beautification, right? I love this pattern, and the cover is simple to put together. There are a few simple tricks that make it even easier (come to the class and I’ll tell ya)! You can sign up for the class on the Quiltique website. If you’re not a local, but still want to make the ironing board cover, you can get the pattern online at Quiltique here. Cotton Way has another ironing board cover pattern as well, it is available at Amazon here.